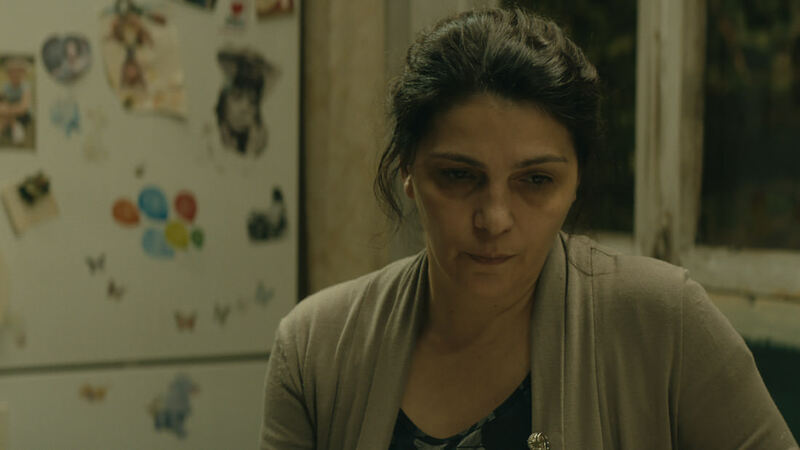 If a wife and mother deciding to just up and leave her family with no real explanation would seem like the impetus for considerable conflict, Nana Ekvtimishvili and Simon Gross’s Georgian film festival darling “My Happy Family” is less interested in traditional drama than atmosphere. This is evinced almost immediately in our introduction to a sprawling Georgian family where the wife and mother in question, 52 year old Manana (Ia Shugliashvili), absorbs her mother’s (Berta Khapava) nagging while her husband Soso (Merab Ninidze) offers no assistance. Soon after, the movie cuts to the living room where the camera picks up Soso admonishing his son, who the camera tilts over to find working on his computer. Soso then crosses the frame, and as he does, the camera tilts further left, finding his daughter and her boyfriend Vakho (making out on the couch. As they do, we overhear Soso’s mother and father in law bickering, which the camera tilts up to see, before everyone is summoned to the dinner table, in the back of the room, which the camera, never cutting, picks up in a wide frame. It’s a nifty demonstration of the cramped, noisy quarters, how there are so many people in the home that they just appear whenever the camera moves, and what becomes most revealingly conspicuous as the scene ends is Manana’s absence from the table. It’s like she’s begging for a moment alone. That Manana moves out not long after is sort of connected to her job as a schoolteacher, where a student’s confession about her home life spurs Manana to act, a device distressingly reducing her profession to nothing more than a narrative engine, which is made all the more distressing because in the wake of the aforementioned evocative atmosphere this engine is entirely unnecessary. Her living situation exudes a weight squeezing out all her life. For her birthday she repeatedly states her desire to her husband not have a party, including in a scene in the front of their car which Ninidze plays with the air of a man talking without listening. Indeed, he and Manana’s brother throw a party anyway, inviting their friends, all of whom raise a toast to Manana without even really acknowledging her, as if the toast is more about the idea of her, or more about their idea of her, than about, you know, her. This scene mimics one later, after she has moved out, at a dinner party where friends raise a toast to her newfound independence only to turn the conversation to their own petty thoughts as Manana wanders away, unnoticed. Culling from the Romanian new wave playbook, with long takes and deep frames often chock full of people, “My Happy Family” smartly forgoes a traditional musical score to underline the real world cacophony. So the few moments that this cacophony drops out at Manana’s own place, like when a Mozart sonata drifts through the apartment, or when the wind is heard whipping through the trees just outside her window, the absence of clatter becomes restorative. Manana even takes her meals in front of the window to better hear the sound of the wind and nothing else, and while the camera settles down in these shots, dispensing with the herky jerky camera work of her former home, it also is positioned behind her, as she faces outside and away, granting her desperately needed privacy. The movie that kept jumping to my mind was “Twice in a Lifetime” (1985). Though they are not exact parallels, as Bud Yorkin’s film involves a Washington husband leaving his wife for another woman, which the movie affords an impressive level of honesty and complicated understanding, I thought of it because “Twice in a Lifetime” still found a way to sort of close the book even if it understood its particular wounds would never completely be healed. In “My Happy Family”, however, where Manana is both given space by her husband and repeatedly pulled back into her family environment to help put out fires, those wounds are deliberately wide open. In fact, the movie ends not with an affirmation but a question. If no answer can be tendered, that’s just right. Sometimes things just are.